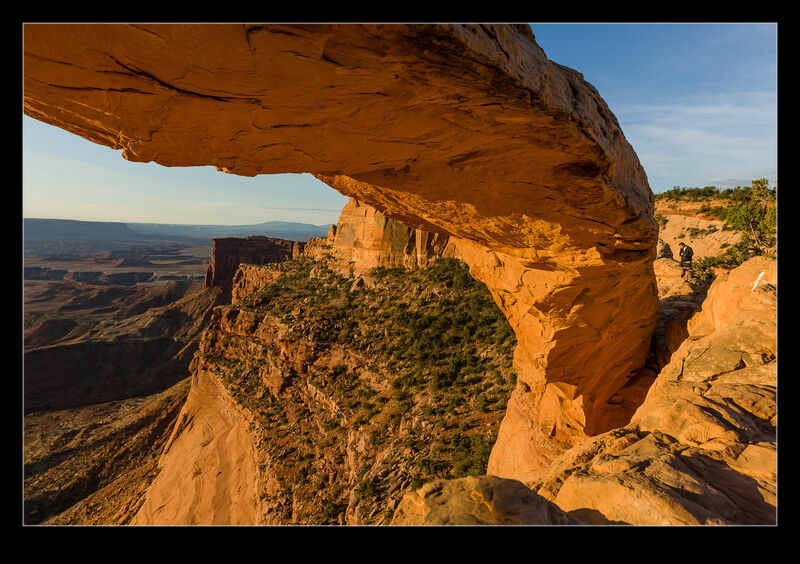 I was watching a YouTube video recently where they discussed photographing Mesa Arch in Canyonlands. 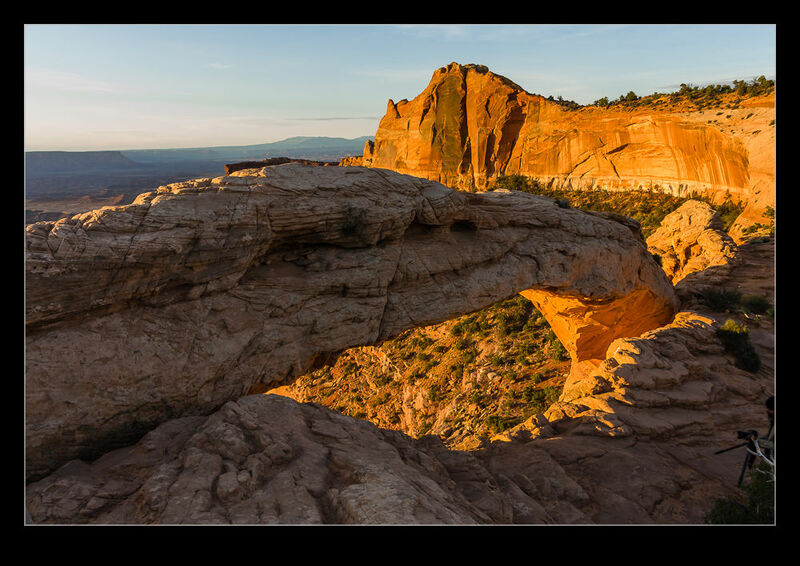 This is one of my shots from my visit there and, while I had some similar experiences to the guys on YouTube, I also had a great overall experience.Mesa Arch is famous for the sun rising through the arch. I wanted to be there for that so an early start was required. Getting there requires a reasonable drive from Moab but we were staying a bit outside Moab anyway so we had a longer drive. I wanted to get there in plenty of time so we started out very early. As we drove into Canyonlands, I could see some large taillights ahead of me. It looked like a coach and where else would it be going at this time of the morning. Sure enough, we followed it in to the parking lot near the arch. The coach disgorged a group of tourists from Japan and we followed them up the trail. At the arch itself, a ton of people were lined up directly in front of the arch. We decided to hold back a short distance and see how things played out. Everyone was waiting for the sun to appear over the horizon. The good thing about shooting landscapes instead of aircraft is you know what time things will happen. Sunrise is never late and, while it might be overcast, the sun doesn’t go tech. Up it popped. What followed was quite funny. There was the sound of lots of shutters clicking as soon as the sun popped up. I’m sure it wasn’t immediate but it then felt like everyone turned and walked away. About fifteen minutes later there were probably half a dozen of us with cameras and tripods left alone. The group worked well together moving around and giving each other space and time. Here is the best bit. The sunrise was okay but nothing special. However, after about fifteen to twenty minutes, the light started to really illuminate the rock surfaces around us. The walls and the underside of the arch were glowing. It was infinitely better than when the sun came up and hardly anybody that had trekked out early that morning saw it. They had all gone. Those of us that remained had a great time. If you ever go to Canyonlands, be patient! 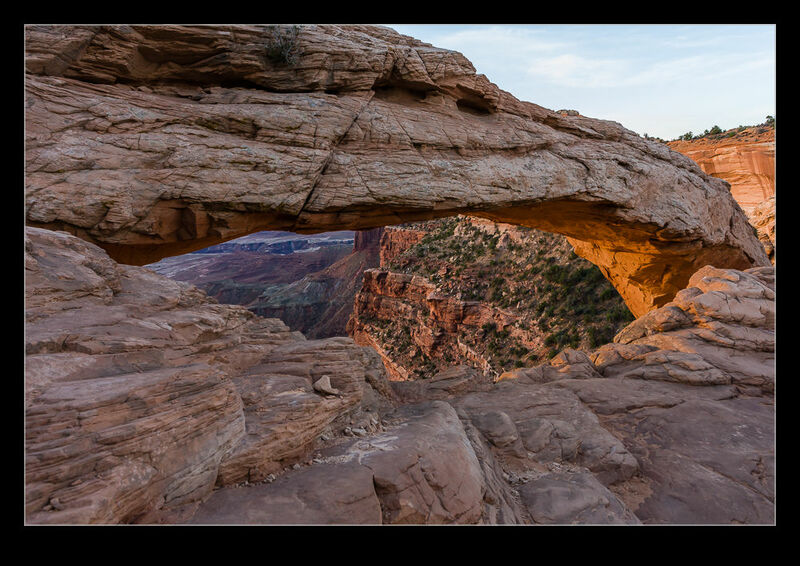 This entry was posted in photo, Travel and tagged canyonlands, mesa arch, moab, national park, photo, sunrise, utah. Bookmark the permalink.